On March 31, 2018, Square Enix Japan cancelled three of their old mobile game services: Final Fantasy Mobile, Dragon Quest Mobile and Sueni Mobile. There is thus no longer any way to acquire and play these games even if you live in Japan and went through the trouble of getting an old flip phone. Before Crisis was online for 13 1/2 years, from 2004-09-25 to 2018-03-31. At the same as the mobile services were taken down so were the official websites for Before Crisis and Dirge of Cerberus: Lost Episode removed. These can now only be viewed via the Wayback Machine. Find links to these, and other relevant content, at the end of this article. None of these three titles, at the time of writing, have been ported to smartphones and they are not being distributed by any other services. 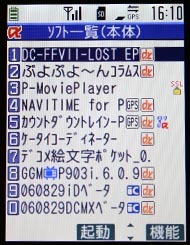 On top of this there are currently no signs that any of these games have been pirated. Can we even trust that Square Enix themselves will have made sure to archive the game- and app files for their old phone game services? Anybody with a passing knowledge of game preservation and the game industry knows that archival procedures tend to be poor even by those who developed the game(s), so we are now left without knowing for certain if these old mobile games, if indeed these Final Fantasy VII spin-offs, are now permanently lost. Those who have frequented the Lifestream forum thread ”The FFVII Mobile Game Initiative (2004-2008 Era)” know that in late 2017 I set a goal to acquire these games before the servers for Final Fantasy Mobile were discontinued. I failed in this mission, despite reaching out to many different people on multiple platforms. The loss goes beyond simply not having the game files. 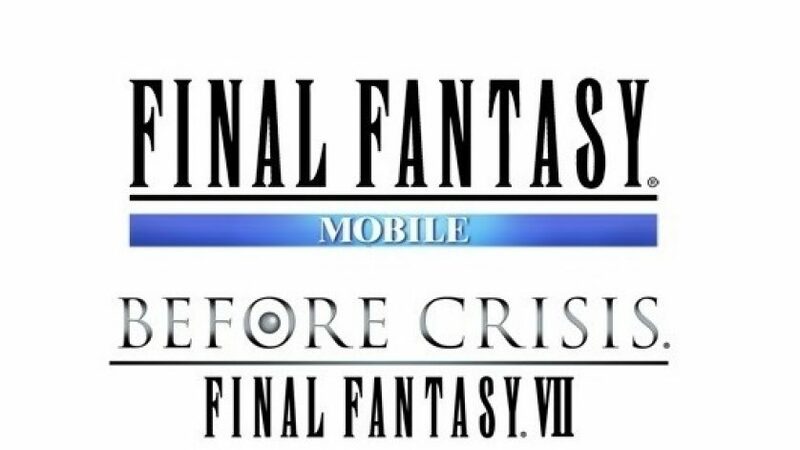 With Before Crisis, while we have video recordings of the main story campaign there are still many aspects that we do not possess video recordings for: The Wonder Square, Chocobo Racing & Battle Square of the Gold Saucer, Rescue Mode, Weapon Mode, Special Episode Reno, Special Episode Legend etc. In the case of FFVII Snowboarding, just like with its North American counterpart, we have zero video recordings and the only screenshots we have are those that were distributed officially for promotion. We are blessed with recordings that show all the cutscenes and a decent amount of gameplay for DoC: Lost Episode –FFVII–, but just like with the other titles we lose a lot of potential knowledge by not having the game files to emulate and explore. At present, all we can realistically hope to acquire are the respective demos for DoC: Lost Episode and Before Crisis. 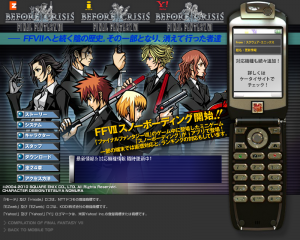 Lost Episode was released as a demo in 2006 with the P903i and P903iX HIGH-SPEED cell phones and the demo is expected to be reasonably easy to extract since the demo is easily playable on the phone. I own several copies of the P903i and have played through the demo half a dozen times. 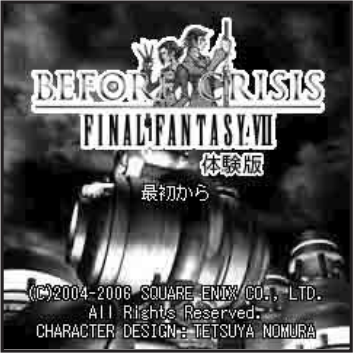 In February 2007 a demo of Before Crisis, limited to the game’s first Chapter (although it is unknown if the demo includes Chapter 1 in its entirety), was released with the W51H phone. Extraction prospects are looking more bleak here however, since the game demo was only accessible if you had EZweb functionality which was unlocked by having an au subscription. I own one copy of the W51H and have found that auctions for this phone are few and far between, compared to the plentiful P903i. What is the future of Before Crisis and its kin of elusive mobile spin-offs? Is there even a future to speak of, considering that the canon of the Compilation of Final Fantasy VII is currently in limbo due to the FFVII Remake? Square Enix certainly isn’t discarding the legacy of the Compilation even if they undo its canonicity. It is difficult to imagine that Cloud’s Advent Children costume would ever be discarded from his various cameos and crossover appearances even if the FFVII Remake declares a new continuity/timeline. In World of Final Fantasy and in Dissidia Final Fantasy Opera Omnia, we have seen Cloud Strife wielding a Buster Sword that is closer in design to either the original game or to the FFVII Remake design. 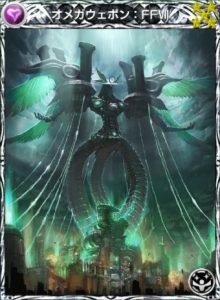 Yet that hasn’t stopped Zack Fair from appearing in both Opera Omnia and in World of Final Fantasy: Meli-Melo wielding his version of the Buster Sword, the ”Compilation” Buster Sword, with the golden hilt that sports carved wings. Mobile titles have also freshly honored the Compilation. 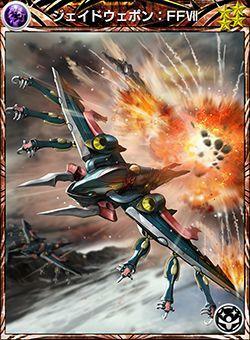 Final Fantasy Mobius includes monster cards for Omega Weapon (Dirge of Cerberus) and even Jade Weapon (Before Crisis). Final Fantasy Record Keeper has hosted Dirge of Cerberus events and recent discoveries show that data is reserved for Before Crisis, Crisis Core and Advent Children events. Whether these events will come to pass is not yet known. We can confidently say that the Compilation of FFVII will not be siphoned out to become a piece of franchise history that is never referenced. But will Square Enix ever port Before Crisis, FFVII Snowboarding and DoC: Lost Episode to modern devices? Has the end of Final Fantasy Mobile led to the original game files being lost forever or has Square Enix made sure that everything is archived for future reference? These are areas where uncertainty rules the day. Regardless of the perceived quality of these titles their loss would mean a needless hole in the history of the Final Fantasy franchise. For now, perhaps the best thing we can do is take this situation to heart and remember to not take for granted that a given piece of media will always be around. Might you become the one who keeps a backup of a particular mobile game that, without your effort, would have been entirely lost? 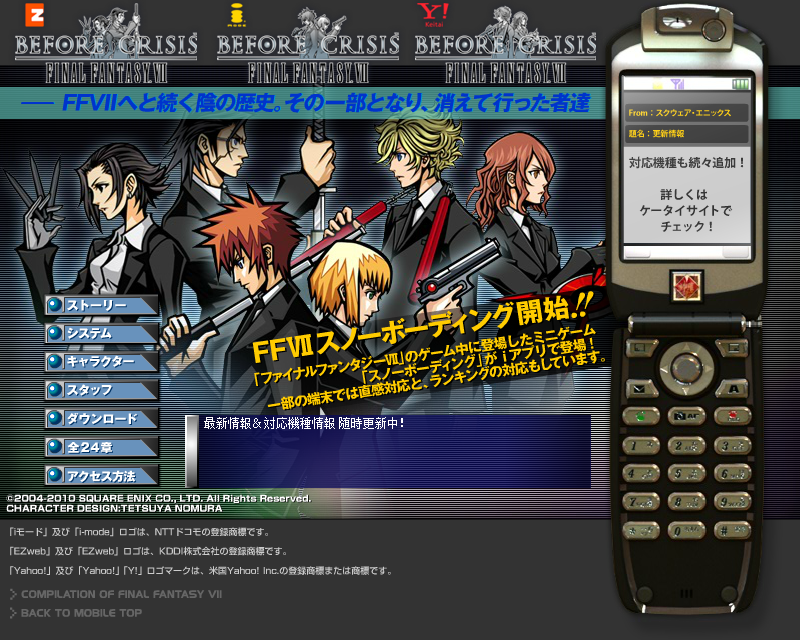 They should make Before Crisis: Final Fantasy VII for Smartphone Android touch screen phones. But have it for Japan and America to play and not have it as a Japan only thing. They should make Before Crisis: Final Fantasy VII for PS4/5 remake and release it worldwide. I’ve been longing to at least see Episode Reno and Episode Legend walkthroughs.